After the riot that followed the grand jury’s decision last week not to indict Darren Wilson, members of the Oath Keepers—a controversial group of current and former military, police, and public safety officials who have pledged not to obey unconstitutional orders—arrived in Ferguson, Missouri. Armed with rifles and fire extinguishers, they stood guard on the rooftops, ready, they said, to protect local businesses from arsonists and looters. “I opened the window and said, ‘Hey, can I help you? '” said Hildebrand, 35, a website developer. Threatened with arrest for operating without a license, the volunteers argued but eventually left their positions early Saturday, [Oath Keepers founder Stewart] Rhodes said. Read more via Oath Keepers Station Themselves on Ferguson’s Rooftops; Police Order Them to Stop – Hit & Run : Reason.com. 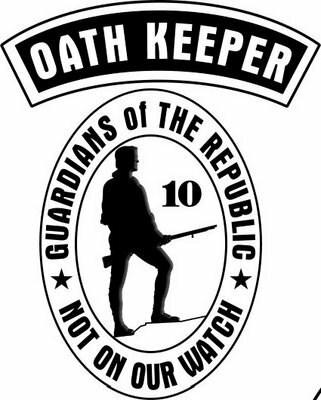 As I see it, business and building owners would only have to put individual Oath Keepers on their payroll just like any other employee. Give him or her a maintenance job. Once the employee/employer relationship is established, the owner could allow the individual to carry a firearm on the premises without the need for a security license since they wouldn’t be security. Thanks for reporting on this. I think the people have a right to know that the Ferguson police are not only inept to handle this situation, but they also want to prohibit the competition from handling it, which it appears the Oath Keepers are capable of doing.